Home ALBUMS ASAP DARREN ESPANTO MUSIC THE VOICE KIDS XIAN LIM Darren Espanto's album gets gold record award, but no TV awarding? Darren Espanto's album gets gold record award, but no TV awarding? Darren Espanto's self-titled album turned Gold a month ago, and his fans, the Darrenatics, have been wondering already why there's no TV awarding yet for the 13-year-old singer. Congratulatory messages are pouring in for 'The Voice Kids' runner-up Darren Espanto, after he posted earlier tonight an Instagram photo showing the gold record award for his debut album "Darren" which was released last December. According to his caption, it makes him very happy seeing the fruit of his hard work and sacrifices. He also thanked the Darrenatics, MCA Music, Star Magic, the album producers and composers, and all those who bought the album. darrenespanto1: "Seeing this made me so happy. This was issued on MARCH 3! All the hard work, sacrifices and support has made this achievement possible! I love you guys! Thanks so much first of all to God who made all these blessings possible! I'd also like to thank my friends and family for the love and support ever since! Thanks of course to MCA Music, Star Magic and to Saturno Music for having me be a part of your families! At syempre po sa mga #DARRENATICS na bumili at sumuporta po sa album na ito! I LOVE YOU ALL! 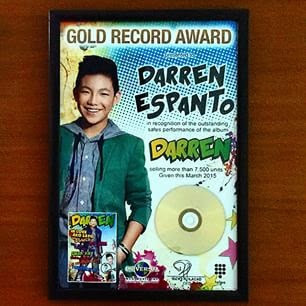 #DarrenGoesGold"
issued already. He already has on hand the gold record award, even before any TV awarding has been made for him. 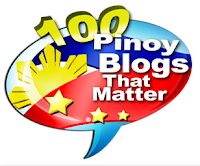 Now his fans are asking: When is the TV awarding? Why is Darren not being properly or officially awarded on ASAP? I understand them. They made sure Darren's album will be a big success, and all they want now is to see Darren being awarded with the gold record award on national TV, as per tradition, to let everyone know that this young boy is now among the gold-selling artists in the country. What I don't understand is why, at times, it's taking long for an album awarding to be done on TV for some singers, but for other singers, it's being done so quick (usually done as a surprise awarding), even if the album turned gold or platinum much later than the others. with proper training and use of outfits during the pageant...i think she can make it!! !